If you are a furniture maker and the nature of the piece that you are working requires that you make accurate square (90 degree) and angled (mitered) cuts in timber, it is important that you have the required skills for making such cuts to be able to make joints in furniture. Joints are also required in building construction. Though accuracy is not always required, sometimes, some work requires certain level of reasonable accurate cutting. So, whether you are just a do-it-yourself professional or a professional, it is necessary that you learn to acquire accurate cutting skills. For example, there may be a need to cut an architrave around a doorway or window or the need to redo the skirting at the base of the wall. There may also be a need to replace the damaged shed or board from your home cladding. During such situations, the tips given here will be useful to you. First step: Begin by marking the size of the cut that you want to make. You will need a sharpened pencil to mark clear but thin line on the timber. You will also require a tape. Measure out the dimension with the tape. The tape hooked end should be placed close to one of the edges. Stretch it to the length you want and then mark. Note that if you are working with a lumber that you bought from a store, it will come with a 90 degree cut. However, to be on a safer end, you have to verify that using your carpenter square. If the lumber is not straight, then you have to make it straight or 90 degrees by cutting out a small section following the guidelines that will be given below. You can continue with the rest of the process once you are able to make the end of the lumber to be straight. With a carpenter square, you will be able to make 90 degree cuts on your timber. There are different types of square. You can use a triangle set square or engineers square. Hold the handle or stock of the square firmly against the lumber while marking. It is more appropriate to position the pencil’s tip on the initial mark you made when you were measuring. Slide the square so that it will rest against the tip and then mark along it. The next thing that you have to do is to mark both vertical sides using the pencil and straight edge of the square. At this stage, you can now cut the lumber. 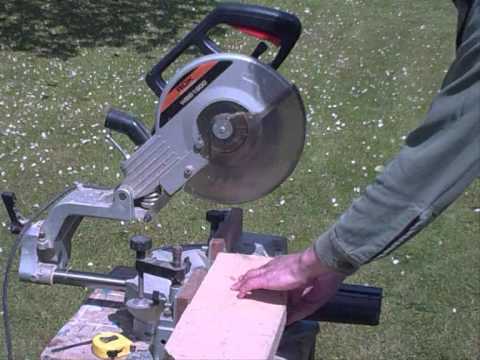 You can cut with a hand saw or with a miter saw or other types of saws such as tenon saw and miter box. But what concerns us here is cutting with a miter saw. Mitre saw is a cutting tool which is specifically meant for cutting angled mitre cuts or 90 degree. It is different from a hand saw. It is available in different types. There are basic ones which can be used to cut wood up 4×2 dimension. A sliding miter saw on the other hand can cut lumber up to 9×3 thanks to its cutting head which is capable of sliding on a rail. It does not require any huge diameter disk before it will be able to cut. There are different sizes and types of blade for miter saws. The major difference among these blade is the number of teeth they have. Fine cut are obtained with blade with many teeth but they make the cut slowly. Blade with coarse and few teeth cut very fast but the cut is rough. The tip given for marking is actually for people that do not have miter saw or that want to ensure high cutting accuracy. This is because a mitre saw by design can cut 90 degree. All you need to do is to readjust the grub screws in order to make sure that the saw deliver accurate and right angled cut or mitred cut. After cutting, use a carpenter square to check the cut to see if your miter saw is capable of making accurate cut. If the cut is not accurate, you have to readjust it again and again.